Investment expenditure in Europe collapsed after the 2008 Global Crisis. This collapse followed a boom during which the corporate sector borrowed heavily (Gopinath et al. 2017). 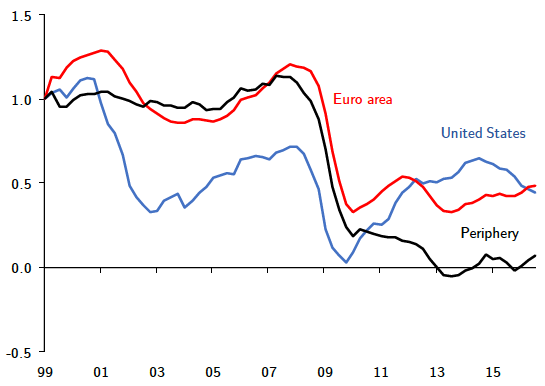 Figures 1 and 2 illustrate the extent of the increase in leverage and investment collapse in the euro area and the US. The collapse in investment and increase in leverage during the boom were particularly apparent in Europe's periphery economies (Greece, Ireland, Italy, Spain, and Portugal). Note: Net-of-consumption fixed capital formation of non-financial corporations scaled by total-economy GDP. Note: Credit to non-financial corporations granted by banks and non-banks, scaled by total economy GDP. In a new paper (Kalemli-Özcan et al. 2018), we investigate whether the corporate debt accumulated during the boom years reduced investment in the non-financial corporate private sector after the crisis. Specifically, we consider whether high levels of corporate debt translate into lower investment rates, a situation we refer to as 'debt overhang'. We argue that the maturity structure of corporate debt is crucial in understanding the effect of debt on firm-level investment. If the debt accumulated during the boom years is mostly short-term – i.e. its remaining maturity is less than one year – there is an increase in the 'rollover risk' associated with such debt. This is because lenders are often unwilling to renew expiring credit lines during a crisis, when collateral values drop. To estimate the effect of debt overhang on firm investment, it is also important to separate reduced credit supply by banks from the role played by firm indebtedness. We match our firms to their banks to consider how the debt overhang and rollover risk effects interact with weak credit supply from banks in a period of tightened lending conditions. During the European sovereign debt crisis, lending conditions deteriorated because of weak bank balance sheets with high levels of exposure to risky sovereign debt (Gennaioli et al. 2014, Becker and Ivashina 2018). As a result, banks might cut lending to all firms regardless of their financial positions, such as the level and maturity structure of their debt. To distinguish the impact of weak credit supply from financial frictions arising from leverage and maturity structure of the firm’s debt, our analysis therefore considers the sovereign risk exposure of banks as a measure of bank weakness. Our analysis is based on a comprehensive firm-level data set including small private firms from the ORBIS/AMADEUS database. 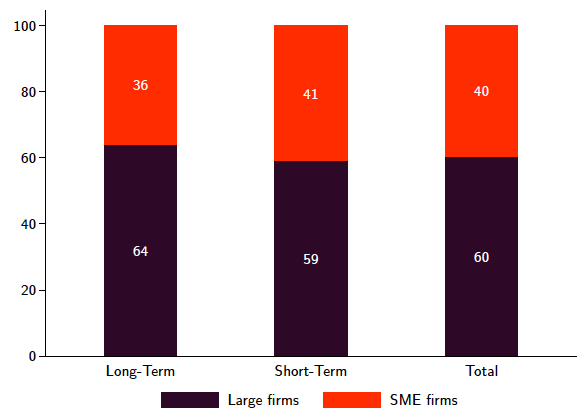 Figure 3 shows the importance of covering firms of all sizes – small firms account for about 41% of total short-term debt. We match the firm's main relationship bank to its balance sheet using the information in BANKSCOPE. In order to separate banks’ exposure to their own versus other sovereigns, we use confidential ECB data, which has nationality information on sovereign exposure. The final matched dataset has more than 2 million observations, covering firms and their banking relationships in eight European countries from 2000 to 2012. Source: Kalemli-Özcan et al. (2018). Note: Aggregated from firm-level data. SMEs are firms with fewer than 250 employees or with total assets less than €43 million (2005 prices). 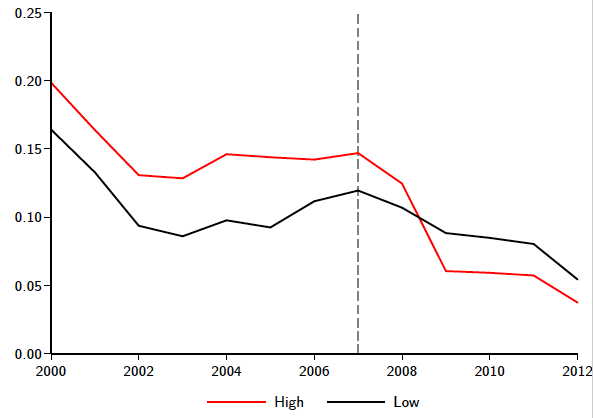 We compare the impact of leverage and debt maturity on investment pre-crisis (2000-2007) and post-crisis (2008-2012). We condition on aggregate demand shocks using four-digit industry-country-year fixed effects, to absorb the impact of changes in credit demand for the four-digit sector in which firms operate, as well as any changes in country-level demand conditions. This would include changes in sovereign risk and general uncertainty conditions. We also control for bank fixed effects to capture the role of pre-existing bank relationships. Figure 4 shows the evolution of net investment over time, comparing firms with high and low financial leverage. It is clear that investment declines more during the crisis among firms with high financial leverage, while investment trends pre-crisis are similar. Note: 'High leverage' implies ratio of total debt to assets before 2008 above median. Firms with higher leverage reduce investment more, and this effect is stronger when those firms are linked to weak banks. Firms that borrowed more short-term suffer from rollover risk and decrease investment more, and again this effect gets stronger when these firms are connected to weak banks. The effect of bank weakness is strongest for banks in peripheral countries with large exposures to sovereign risk through their holdings of own sovereign debt. The debt overhang and rollover risk channels are quantitively both important. A back-of-an-envelope calculation based on our firm-level estimates suggests that the debt overhang and rollover risk channels explain about 60% of the decline in aggregate corporate investment during the crisis. So debt overhang and rollover risk of firms, compounded by an impaired bank lending channel, played a significant role in reducing corporate investment during the European debt crisis. This suggests that we need growth-enhancing policies that more directly target the financial conditions of firms. These would reduce the debt overhang, and therefore stimulate the real economy. The results also show the danger of relying on short-term debt to finance investment during good times. Becker, B and V Ivashina (2018), "Financial Repression in the European Sovereign Debt Crisis", Review of Finance 22(1): 83-115. Gennaioli, N, A Martin, and S Rossi (2014), "Sovereign Default, Domestic Banks, and Financial Institutions", Journal of Finance 69(2): 819–866. Gopinath, G, S Kalemli-Özcan, L Karabarbounis, and C Villegas-Sánchez (2017), "Capital Allocation and Productivity in Southern Europe", Quarterly Journal of Economics 132(4): 1915–1967. Kalemli-Özcan, S, L Laeven, and D Moreno (2018), "Debt Overhang, Rollover Risk, and Corporate Investment: Evidence from the European Crisis", CEPR Discussion Paper 12881.